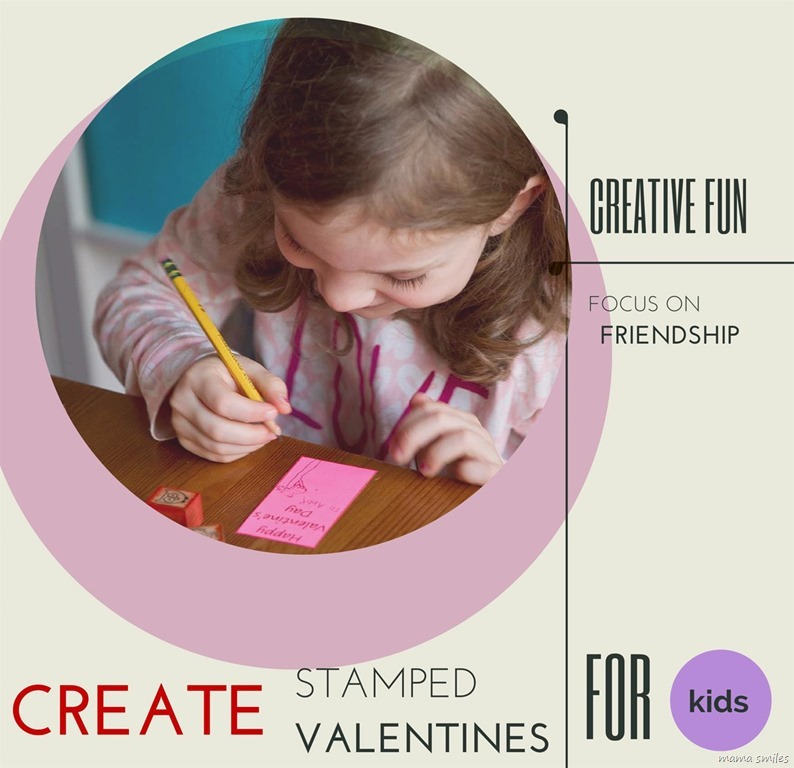 Stamped valentines are easy for kids to make and can be customized to suit the child’s interests, or their friends’ interests. This week’s Virtual Book Club for Kids pick is Guess How Much I Love You. This delightful classic children’s picture book pairs beautifully with this simple DIY stamped valentines activity for kids! 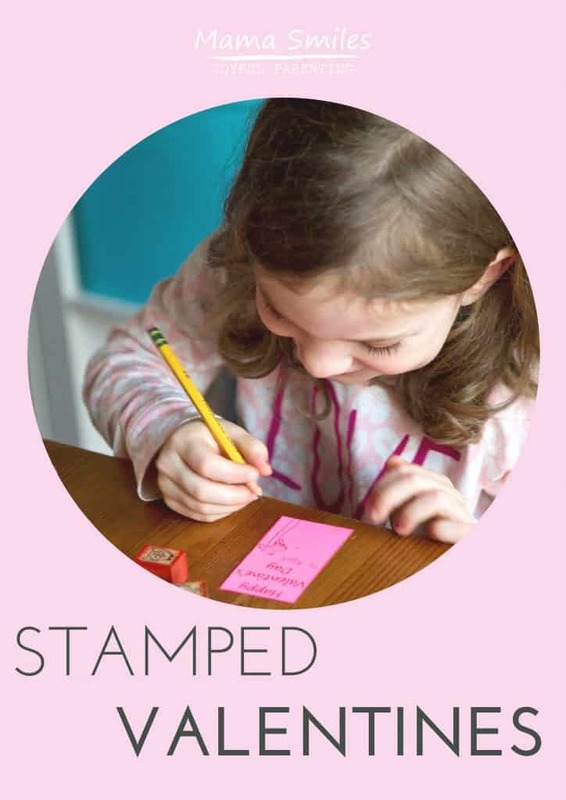 Five-year-old Lily and seven-year-old Johnny used the same Valentine template I created for Emma to make stamped valentines for their classmates. This was a less labor-intensive project than the burlap valentines. Simpler was nice for these younger kids, and they still had plenty of room for creative expression. Lily got particularly creative, drawing trees for koala bears and other sweet details. Johnny kept his valentines pretty simple, but he put a lot of thought into which friends got which stamps based on their interests. I appreciate that the school they are going to this year emphasized that they wanted kids to put thought into cards rather than bringing in treats. Thoughtful cards really make this holiday for me. 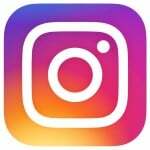 I see Valentine’s Day as a wonderful way for kids to celebrate friendship and express appreciation for their classmates. Our valentines this year are very simple, but my kids put a lot of thought into each one and I enjoyed hearing them talk about their friends. I also like that, since the kids are required to bring a card for every child in their class, this gets them thinking about kids who they do not know as well. We spread our card making over several days, partly to keep the kids from getting tired of writing but even more so that they would have time to think about each individual classmate. I noticed that my kids made cards for the kids they knew best first, but then with time were able to make thoughtful cards for kids they did not know as well. I will be thrilled if this exercise paired with our Valentine Fairy helps my kids makes some new friends this month! 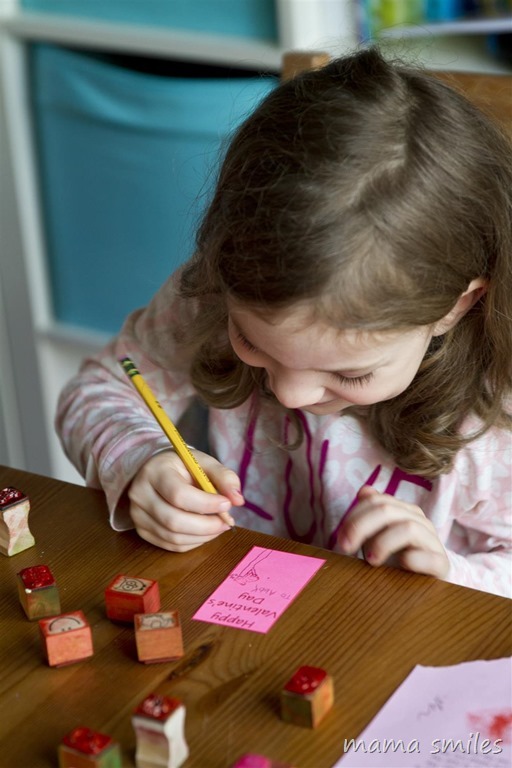 Eight-year-old Emma spent a LOT of time personalizing her cards – with drawings, quotes from books, and inside jokes! 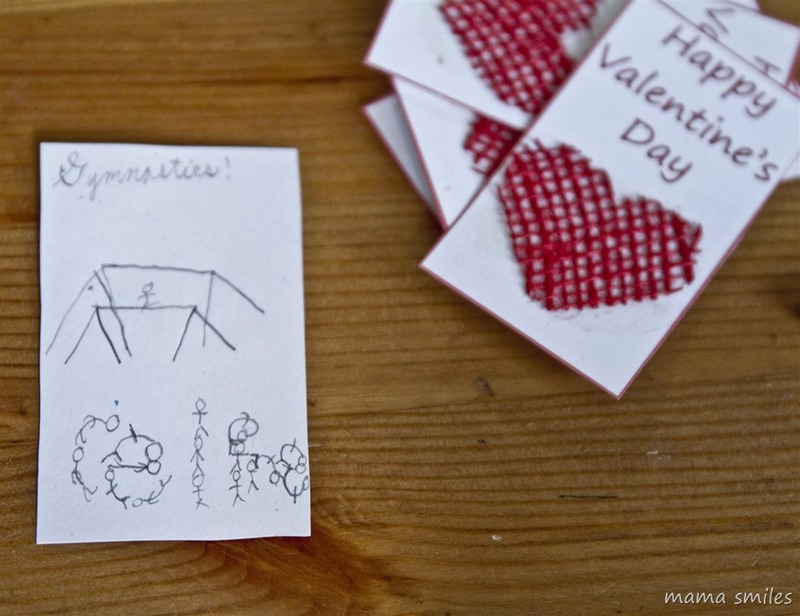 Have you ever made stamped valentines with your kids? 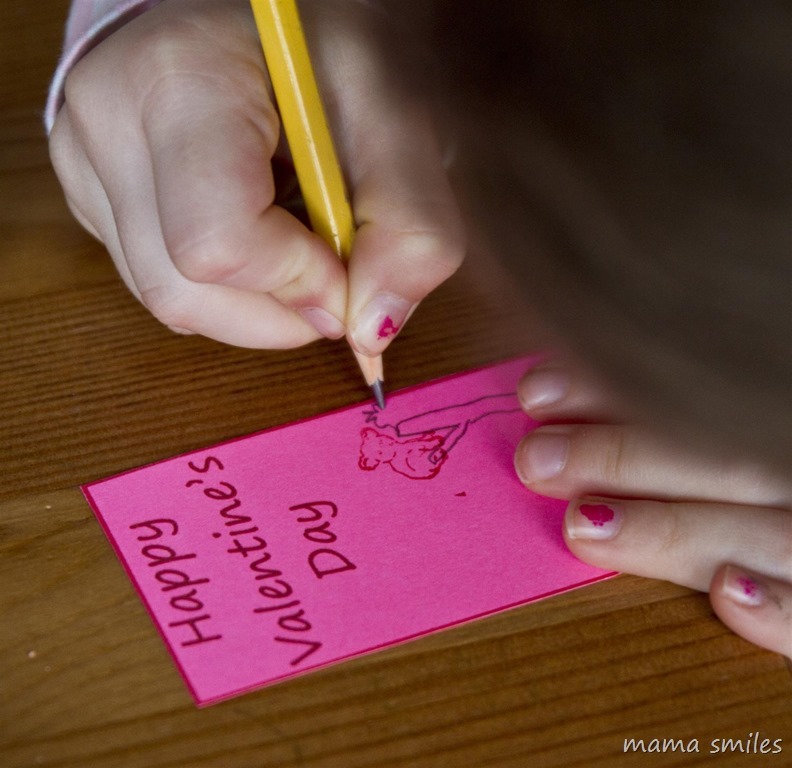 Are your kids making Valentine’s Day cards this year? How does your family celebrate this holiday? Great job, John and Lily. Their Valentines look beautiful! It was so fun to see their enthusiasm making these! I love how you’re raising your kids to be both thoughtful and clever! 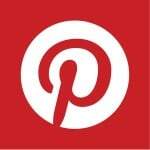 This activity combines the best of both worlds. I particularly love how Emma included quotes from books!! My husband and I exchange small gifts on Valentines’ Day – it’s the day he proposed to me 18 years ago! I like how versatile your printable is! Love the tactile burlap and the stamp drawing combo. I also like that treats were discourages! My daughter made her own, each had a different game, quiz, or activity inside! My son used my spy ones for the boys and for the girls he wanted princesses so I whipped up some of those :-) Happy Valentine’s Day! 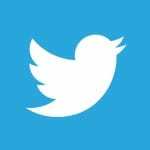 It sounds like your daughter has inherited your creativity! This year we were traveling for Valentine’s Day, so no party for us this year. Though Princess did spend a lot of time looking for presents for all the adults and making cards for everyone. I love that she put so much thought into each card! I bet her classmates really appreciated that.